Hi there blog friends! Remember yesterday when I said I was gonna rustle up some of the new stuff on my desk to gussy up into a card. (Speaking of new stuff, I mention some Blog Candy at the end of my post). Well, today I have new things to show and I know you can’t really hear the excitement in my voice but you would have if you had been in my craft room. This is the first chance I’ve had to touch these things and, well, . . . LOVE! 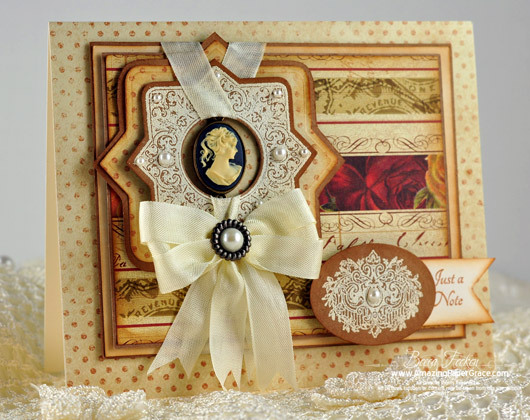 First of all – new dies and you know that new dies make my heart sing! JustRite Stampers has new Spellbinders manufactured custom made dies – the one I’m using today is called Nested Medallion Labels. I promise you don’t have anything like this shape in your repertoire – it’s absolutely regal if you ask me. Of course there are stamps (conveniently) to match that die template – the set I’m using today is called Always and Forever Medallion Labels. These are new CHA releases but if you just happen by JustRite Stampers and peek in the store – there are tons of new things – check them out HERE (very big grin) – now if you are easily enabled, think twice before clicking, okay? Yep, these have all been sitting over in the corner – it has been torture! So I did some simple layering because I love the look of this die template. 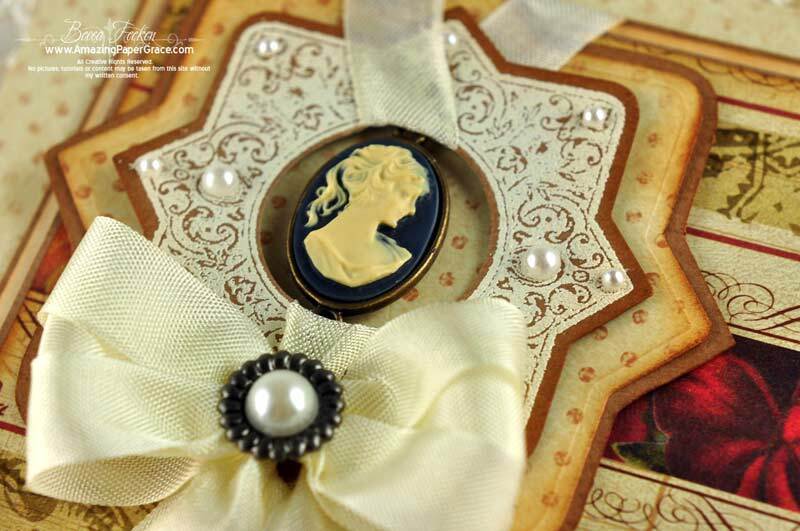 Then I looped my seam binding through one side of the medallion and followed around the backside of the card and up through the other side of the medallion. This left me two ends so that I could tie a bow. The cameo is a Bead Landing trinket from Michaels and I knew they would be a nice size for cards. By the way, JustRite is having a retirement sale – so just as the words says, once they are gone, they are gone. If you didn’t get your favorite 1 5/8″ or 2″ Original JustRite sets when they debuted, some of these are up to 75% off – a bargain hunters dream. Here’s the link – JustRite Retirement Sale. Since you all are the most wonderful readers ever, I wanted to let you know I’ll have New Years Eve Blog Candy. I guess (after all the smooching’s done) right after midnight CST, you might have to come and peek in to see what I’ve got. It’s been about 5 months since my last candy so I’m a little bit rusty at this. Remember, I said I have new stuff, so hmmmm….let me dig around and see what I can rustle up!! I’ll see you later on!! As always, your card is absolutely GORGEOUS! Thank you so much for the inspiration! And, thank you for always sharing your beautiful creations with us…you are truly AMAZING! I also want to wish you the best of health and happiness in the New Year! God Bless You, today and always! Hugs and Much Love for a Happy and HEALTHY New Year my friend! Oh, Becca, how you keep coming up with the most fantastic cards is just AMAZING! This is truly a beautiful card and I guess I’m going to have to hit “that button”! Have a great and “healthy” New Year. Ohh DARN!!! What great new stamps! I just HAD to LOOK! Beautiful card-as always! I empathize with your hip pain. I have a bit of that too! Today’s post is gorgeous…as always. Beautiful card Becca. Your right those new dies and stamps are Wow! Happy 2012 to you. Oh, how I love this card especially the Cameo as well as them dies.on there. Simply Gorgeious. Guess I’ll be making a trip to Michaels early next week. I need to get me some trinkets anyway. Wishing you a Very Happy new Years to you Becca and thank U 4 All the great inspiration you have given through the years. Happy New Year Becca! I wish you a healthy, happy and prosperous 2012. May God bless you and your family. Gorgeous card Becca. I’m going to have to check out those websites. May our Lord bless you with many , many , many more years of sharing your wonderful talent with us (actually, I should say..”our Lord bless us”, since it is a blessing to us). As always, your card is “fantabulous” and you are such enabler. Off I go to see these new dies and matching stamps. Oh Becca I just love coming here! I must admit I’m usually a lurker, but you make thee most elegant cards! I’ve also just discovered Spellbinders….I know……LOVE! WOW what a lovely card!!! I find such inspiration in your blogs, what you creat is paper art work, with such gorgeous embellishments, the best bows, and to top it off your quotes always touch me in the moment for that day!!! Whom ever gets your cards must feel such a warmth of friendship, kindness and love. Doesn’t everyone one of us followers dreamI of getting one of your gorgeous cards. Thank you for a chance at winning blog candy. Wishing you a healthier New Year, and looking forward to your many inspirational blog postings. I’ll keep you in my thoughts and prayers for good health! Hi Becca Sorry I’ve been MIA for so long but now that the insanity of preparing for the holidays and craft shows are over and sadly the family has all returned to their homes after a fabulous Christmas, I’m back. So sorry to hear of your health issues. I do hope 2012 will get you mended and Our Heavenly Father will bless you and yours with all that’s good. As always your card is a delight. I love the new ‘stuff’ the colors and papers you’ve used. I love the new stamps & dies! Your card is gorgeous! I cannot wait to get mine! Happy New Year, Becca! I wish you and your family good health, happiness & many of God’s great blessings! Beautiful, beautiful.. guess it is time for a large order.. was saying after the first of the year I would make an order, but you sure know how to get a person to order… This is gorgeous Becca… Love everything and your card is just so stunning… Another winner Girl!!! and may each day be happy and healthy for you and your family. Your card is soooo beautiful! I love the soft vintage style. This really looks like it might have just come from a box of grandmother’s keepsakes that were tucked away. I never thought you will be there today. What a beautiful surprise. Avery perfect realization. Happy new Year Becca ! I wish just the best for you. I will try to be there tonight. Becca; you’re so awesomely talented. Every day I look forward to seeing what your creativity has conjured up. I love card crafting too, but could never even come close to thinking up all those new and original ideas that you come up with. You are Amazing Paper Grace! Just LOVE the cameo card! Another great card! I am in danger of blowing yet another crafting budget!!! Love the new die set! LOVE IT! I love the Nested Medallion Labels and you did them justice. The card is absolutely beautiful. Happy New Year, Becca! I haven’t clicked yet, in fact I’m scared to death to do it. I lOVE this card!!! I’ve got some pretty cameo’s but not the rest of the items…and even if I went to just get those…well things tend to fall into my cart. So I’m trying very hard to be good…we’ll see how long that lasts! Hugs and hopes that 2012 will be a happy, healthy, productive year for all. Just Beautiful!!!!! 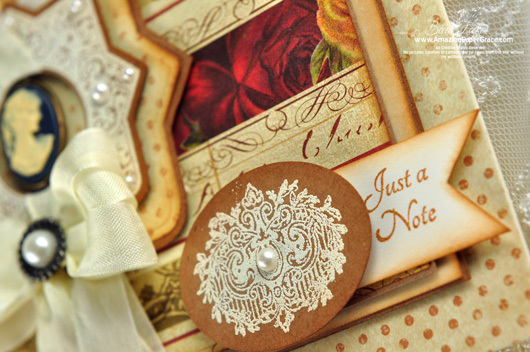 Love these new die cuts…. I enjoy you and your projects so much, thank you for all you have done in 2011 to make it easier for us to create our projects and thank you in advance for all the new exciting things to come. My projects in the next few weeks will be making card kits to have for thank you’s and to give away. Happy New Year, blessings, safety and prosperity to you my friend! I MUST SPEND MORE TIME AND SIT DOWN TO CRAFT, BY THE TIME I GET IN FROM WORK I NEED TO REST, SO I MUST TRY! I AM IN THE UK, I LOOK AT ALL YOUR CARDS, I HAVE NEVER SEEN CARDS LIKE THESE, YOUR IDEAS ARE UNIQUE. Becca, Becca, Becca……another truly elegant card! 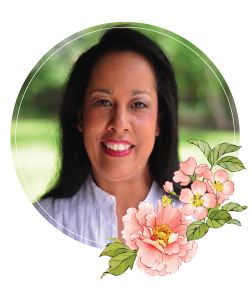 you are such an inspiration to so many crafters! That set of nestibilities isn’t one that I would have picked for myself…… that is until I saw what you have done with it! You have such an artistic mind! Happy crafting and the Health to craft in 2012.
layer and bow! Seems as though you were born to do what you do so well.